Vividly colored, juicy and native to southern Mexico and Central America, papayas are a low-calorie, low-fat fruit that supplies several key vitamins and minerals such as fiber and vitamin C. The two major types of papaya are Mexican and Hawaiian. Although most papayas in supermarkets are grown in Hawaii, others are grown in Mexico and areas with tropical or warm climates. 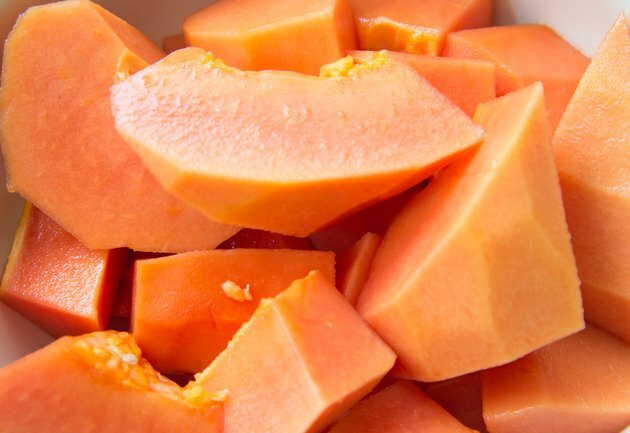 There are also numerous cultivars of papaya that come from Hawaii, Mexico and other places around the world. Mexican papayas are fairly large fruits and can reach weights up to 10 pounds. Mexican red papayas have rose-colored flesh with a sweet flavor, though they aren't as sweet as papayas grown in Hawaii, the California Rare Fruit Growers website notes. Mexican yellow papayas, with yellow flesh, are sweeter in flavor than Mexican reds but also not as sweet as Hawaiian papayas. The Sunset papaya is a small to medium-sized fruit with skin and flesh that's orange-red in color. It's a dwarf plant that originated at the University of Hawaii and produces high numbers of fruit. The Sunrise papaya, which is grown on Kauai, yields fruit that weighs between 22 and 26 ounces and has red-orange skin and flesh. Both types have a sweet flavor, and the Sunrise also has a shallow seed cavity, making seed removal easier compared to other types of papaya. The Kapoho papaya variety has yellow flesh and weighs between 12 and 22 ounces, the University of Hawaii Extension notes. Kapoho papayas are grown in the Puna District of Hawaii, where about 90 percent of the state's papayas are grown. The Waimanalo papaya grows to between 16 and 39 ounces and has orange-yellow flesh and a sweet flavor. The Kamiya cultivar was created at the University of Hawaii and is a dwarf variety. Kamiya papayas have yellow-orange flesh and are juicy and sweet. Though the two types of papaya are Mexican and Hawaiian, the fruit can grow in other tropical locations. The Hortus Gold papaya, for example, is a cultivar from South Africa that weighs between 2 and 3 pounds and has yellow flesh. The Bettina and Peterson cultivars, which grow in Queensland, Australia, have sweet flesh and bear fruit that weighs between 3 and 5 pounds. Sunnybank papayas, which grow in Western Australia, have yellow flesh and bear fruits that weigh a little more than 1 pound. Guinea Gold papayas, which also grow in Western Australia, weigh an average of 2.4 pounds and also have yellow flesh. Other papaya cultivars grow in Peru, Ghana and India.